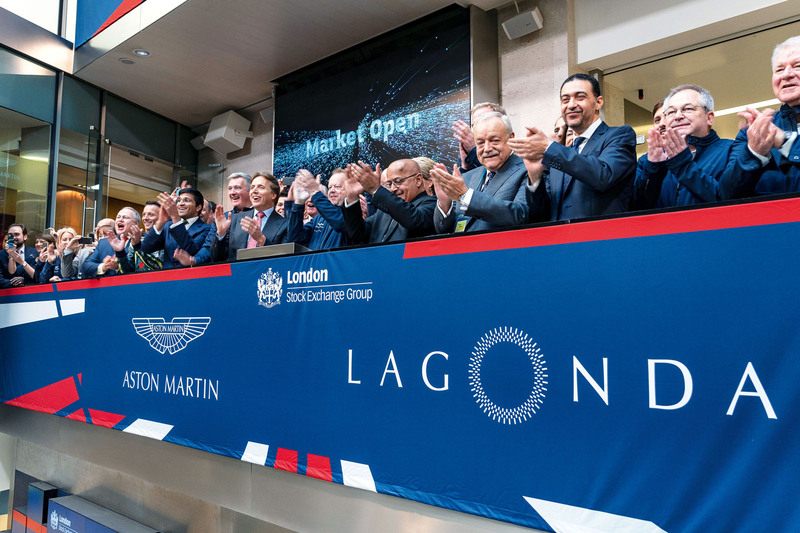 While standing on the first floor of the London Stock Exchange (LSE) with CEO Andy Palmer and 100 Aston Martin faithful, watching the entrance hall clock count down to 8am to begin Aston’s life as a public company, I fell to wondering which of the miracles that have sustained this unique company was the most significant. Was it that this 105-year-old story began with two men in a London shed setting out to build a better racing car and naming it after their favourite hill climb? Was it that seven times in its history, this company has been flat broke, only to be repeatedly rescued (as others were not) by people who knew its value? Or was it that this company, worth less than £1 at times in its unprofitable past, was today being invited into London’s sanctum of the solvent having proved its value at north of £4 billion? This last, I decided, was the most remarkable. The day began at 6.40am in London’s Park Lane, where Palmer and his management team were staying to be ready for the 8am stock debut. A couple of months previously, Aston’s principal shareholders in Italy and Kuwait had signalled their willingness to sell 25% of the company in an initial public offering (IPO), dealing first with big institutions but from 8 October inviting private investors to participate. The last such opportunity ended 28 years ago when Ford bought Jaguar, removing it from the public lists. 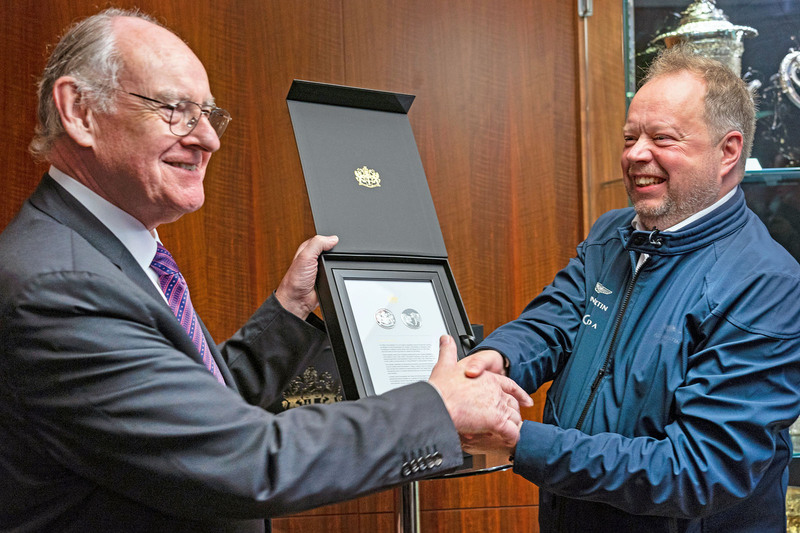 Until we climbed into a Mercedes people-carrier for the 10-minute drive across town to the new LSE, in Paternoster Square under the shadow of St Paul’s Cathedral, I hadn’t appreciated the extent to which Aston’s principals were seeing this as a moment for celebration. Palmer, design director Marek Reichman and CFO Mark Wilson – my companions in the Merc – were weary from business visits to Frankfurt and Paris, but buoyed by this new proof of the value of their past four years’ work. So, it seemed, were the principals of the LSE. They were staging this breakfast with Aston investors, owners, suppliers and customers. Then we’d gather under the clock and watch the first few minutes’ trading on huge screens positioned for moments like this. While heading across town, I learned on the qt that the opening price of Aston Martin Lagonda Global Holdings shares would be £19. Previously, we’d only known it would fall in a range between £18.50 and £20. That would raise £1.08bn for shareholders and value the whole company at £4.33bn (at least six times its value when Ford sold it in 2004). That capitalisation would fall just short of the figure needed to join the prestigious FTSE 100 group of companies, although if it progresses as expected, AML can expect to make the list before long. We assembled. The audience joined in the final three-two-one of the countdown. Then there was a loud fanfare to cover an electronic pause while prices appeared on a big trading page. Amid cheers, the first deal was at £19.05 and trading held in that area for a while, but by 8.30am, it had dropped to £18 and most of the audience had melted away. In interviews, Palmer was coolly observing that as the company’s first IPO had taken 105 years, he wasn’t going to fret about the first half hour. Wilson reckoned that if the shares ended the first day at around £18.30, he’d be happy. Others referred to Ferrari, which floated at $50 a share in 2015 and fell to $35 before trebling the offer price. At the end of the day, the AML shares were £18.25 – on course – but the next day’s headlines had Aston ‘skidding’ and ‘crashing’, although they did neither thing. Those at the helm of Aston Martin were expecting it. If you run a public company, everyone knows your business and has an opinion on what you should be doing next. Those in the know say that it’s the beginning of a long game, but no less exciting for that. Meanwhile down to £14.50 and still falling. That's more of a crash than a skid. I noticed that too. I think they were looking to launch at over £ 20 per share then settled for £ 19. It held close for a while but has dropped since, taking a billion off the value of the company too. Personally I think it's a very risky investment. The DB11 I don't think has continued to see high demand. The V8 Vantage prices I think will crash in the used market. And the new DBS is a DB11 with an ugly nose. These aren't the long lasting classy designs of Ian Callum, but the fussy and over designed ones of Marek Reichman. He's not terrible but hasn't quite found the right pitch for Aston. And that's before the untested SUV model. I fear another Reichman design that just won't sit right. Then there's Palmer who will do just about anything you suggest to him. Speeboats, appartment buildings, helping buillionaires with their toy F1 cars. Anything! The F1 venture is particularly worrying that he seeks to give away all of Aston's profits, and there's so little of that. Reminds me of the old addage of how to make a small fortune in the car industry. The answer, of course, is to start with a large one. In the case of Aston, there are several instances of this in its roller-coaster history. and certainly not a croissant. How is this news and worthy of inclusion in a car, rather than a financial, magazine?